The United States on Monday opened its embassy in Jerusalem under a controversial move by President Donald Trump that has infuriated the Palestinians, who clashed with Israeli soldiers who shot dead at least 52 of them in Gaza, in the deadliest escalation of violence since 2014. "Today, we officially opened the United States embassy in Jerusalem. Congratulations. It's been a long time coming," President Trump said in a recorded video at the US embassy opening in Jerusalem. The American leader said the US remains fully committed to facilitating a lasting peace agreement between Israel and Palestinians. He said that his country supports status quo at the Temple Mount, a flashpoint of Israel-Palestinian conflict that houses the Western Wall (holiest site for the Jews) and the al-Aqsa mosque -- known as Haram al-Sharif. The inauguration ceremony started with the singing of the American anthem and the presentation of colours by US Marines. US Ambassador to Israel David Friedman noted that Washington, which became the first country to recognise the State of Israel, has now taken 'a step awaited, voted upon, and litigated and prayed for for all these years'. "Again the United States leads the way," in relocating the embassy, he said. The move is the result of the 'vision, the courage, and the moral clarity' of President Trump, to whom we own an 'enormous and eternal debt of gratitude', the US envoy stressed. "We have shown the world once again that the US can be trusted," said Jared Kushner, senior adviser to the President and Trump's son-in-law. He also hailed Trump's decision to withdraw the US from the Iran nuclear deal, saying the President announced his intention to exit the 'dangerous, flawed and one-sided Iran deal'. Speaking at the opening ceremony, Israeli Prime Minister Benjamin Netanyahu thanked President Trump for keeping his promise. "Thank you, President Trump, for having the courage to keep your promise," he said. "Thank you, President Trump for making the alliance between Israel and the United States stronger than ever," he said. "You can only build peace on truth. And the truth is that Jerusalem has been, and always will be, the capital of the Jewish people, the capital of the Jewish state," he asserted. 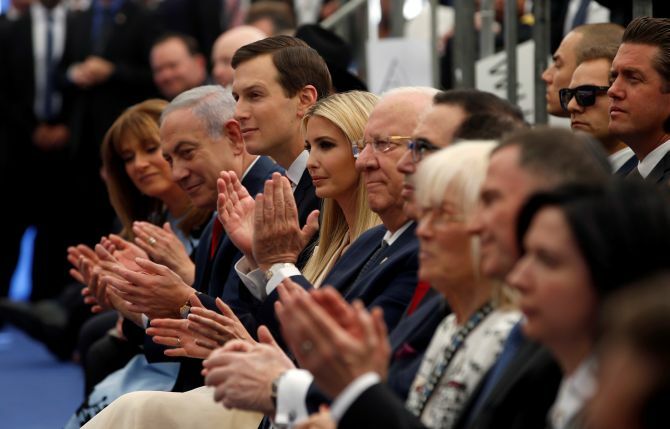 A high-level American delegation that includes Deputy Secretary of State John Sullivan, Secretary of Treasury Steven Mnuchin, Kushner, senior adviser and first daughter Ivanka Trump, and Special Representative for International Negotiations Jason Greenblatt attended the embassy opening ceremony. 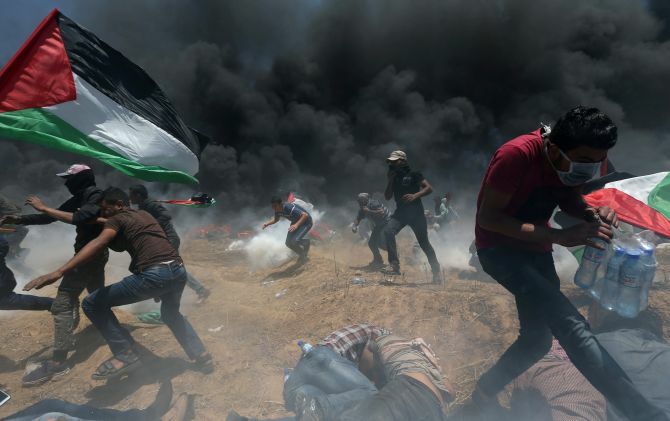 Meanwhile, Palestinians, who protested massively along the Gaza border clashed with Israeli forces, leading to the death of at least 52 of them. According to the Palestinian Ministry of Health, at least 52 people have been killed and more than 2,400 people suffered injuries. Of the 52 killed on Monday, at least six were below the age of 18, including one female. And, of more than 2,400 wounded, at least 200 were below the age of 18 and 11 were journalists. The Palestinian protestors burned tires and threw stones at the soldiers, trying to approach the fence. The Palestinian Authority headed by President Mahmoud Abbas' Fatah party and headquartered in the West Bank town of Ramallah accused Israel of committing a 'terrible massacre' as the death toll soared. Seeking international intervention, Palestinian government spokesman Yusuf al-Mahmoud said that it was an urgent requirement given 'the terrible massacre in Gaza committed by the forces of the Israeli occupation against our heroic people'. The Israel Defense Forces (IDF) released a statement accusing Hamas, which controls Gaza, of 'leading a terrorist operation' and inciting protesters who had amassed by the border fence with Israel to conduct what Israel described as terror attacks. The IDF estimated that around 35,000 people -- who it describes as 'violent rioters' -- had assembled in 12 different locations along the border fence between Gaza and Israel and thousands more were gathered in a tent city about a kilometer from the border. 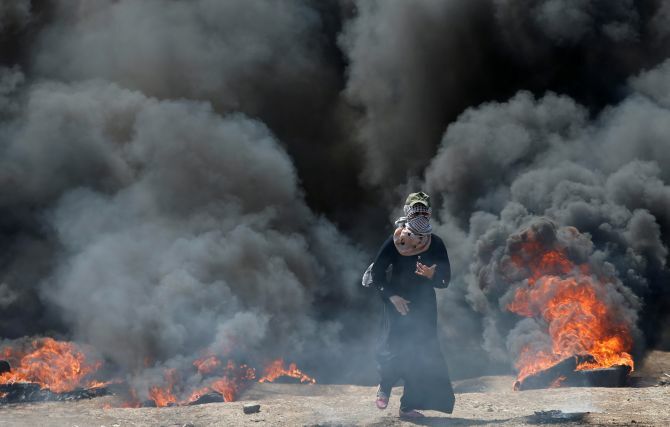 The military said the protesters threw Molotov cocktails, burned tyres, and stones at Israeli soldiers positioned along the fence. 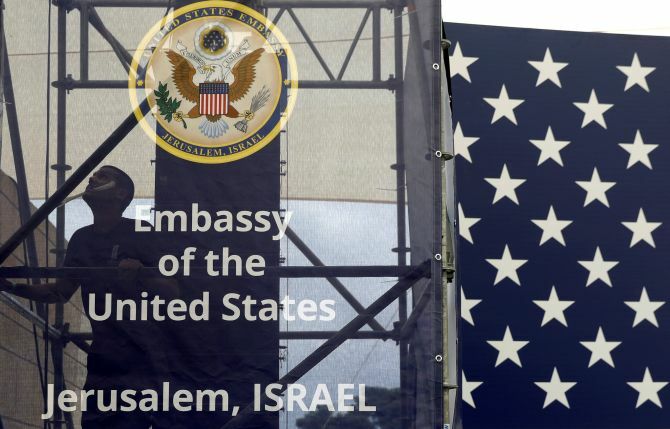 The State Department noted that the opening of the new embassy will take place on the 70th anniversary of American recognition of the State of Israel, the day of its founding and a day that Palestinians refer to as 'the Catastrophe', as hundreds of thousands fled their homes. The embassy move is contentious for Palestinians, who hope to claim part of the city as their future capital, and for many in the Arab world, as it is home to some of the holiest sites in Islam. The city is also home to deeply holy sites for Jews and Christians. The issue has been so thorny that international negotiators had left the question of Jerusalem to the final stages of any peace deal.